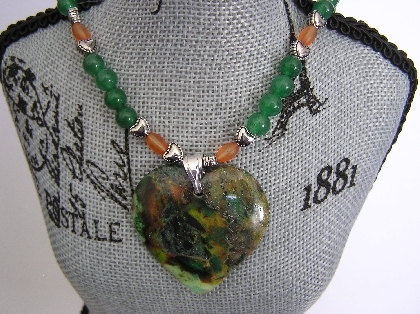 Looking for color, this hand carved Heart of Sonora sunrise Jasper has the colors of browns, dark green, light green, oranges, yellows and grays. 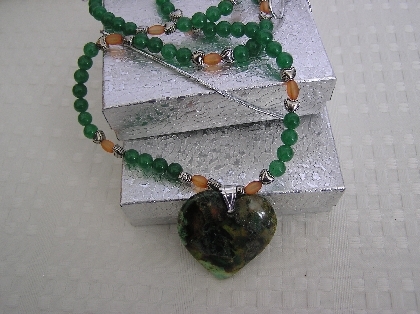 I used Malaysian Jade with a frosted orange glass bead and small silver hearts for the necklace. This piece has a sterling silver bail and toggle. It is approximately 22" and the heart adds another 1 1/2". 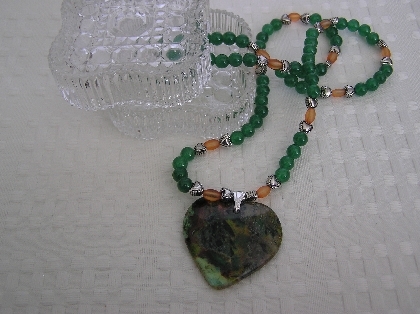 Malaysian Jade is believed to promote Serenity. 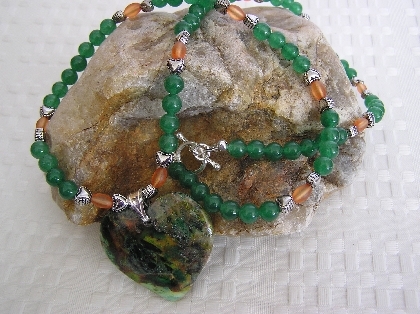 Jasper is one of the birth stones listed for the Sun Sign of Virgo. It is also the Mystical birthstone for the month of October. See the birthstone tables for additional references to this stone. Jasper is an opaque and fine grained variety of Chalcedony. It is found in all colors including: red, brown, pink, yellow, green, grey/white and shades of blue and purple. It often contains organic material and mineral oxides which give it interesting patterns, bands and colors. Crafterbyheart is a Jewelry Shop featuring one of a kind pieces.. Thanks for checking out my Jewelry.